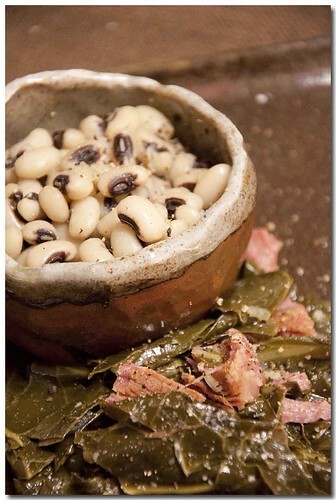 I think it's a southern thang to eat black eyed peas and greens on New Years Day for good luck throughout the year. What ever the origin, it's a wonderful combination be it New Years Day or not. I have the greens nailed, not by any genius on my part, but because I was lucky enough to follow the recipe on the back of a bag of mixed greens. I've not wavered from the recipe ever since a co-worker told me that they were as good as the "church ladies make" if not better. I figured she should know what she's talking about since she's from the south. Here's the link to my Mess O' Greens that I'm eating as we speak. I cook the greens much longer than the recipe calls for though. Taste them after about 20 minutes, if they are still bitter tasting, keep cooking until the bitterness is gone. I think it depends on the greens how long they should cook. I love black eyes peas pretty much, "as is." I only add a little onion and a bay leaf when I cook them and I cook them in ham stock. Deeelicious! Hope you have a wonderful, healthy and prosperous New Year.